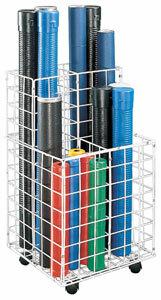 Organizer or safe storage for rolled maps, plans, drawings--anything that rolls up. Four adjacent (7-3/4" square) storage bins keep everything upright. Swivel casters provide high mobility.